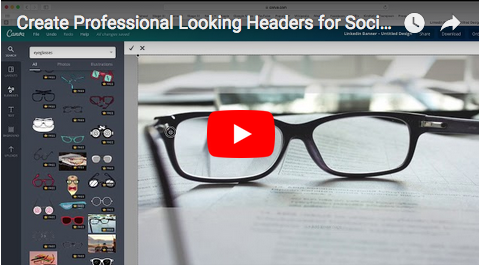 Ever wonder how to create a professional looking header or banner for your social media profiles? Ready to get rid of that plain blue default background and replace it with something that truly speaks your language? With so many social media channels available you have plenty of places to promote your business, but each channel has different dimensions when it comes to those header images that sit behind your little photo. LinkedIn is longer than Twitter, Facebook is higher than LinkedIn, and Google + is completely different than most. Then there’s YouTube Channel Art, if you have a YouTube channel, there’s Tumbler and Web Banners, there are so many no wonder why people get overwhelmed. The fact is that the header on a social media channel is prime real estate for branding and even marketing your business so you’ll want to take advantage of it. Plus it just plain looks better than the default background. You may have no idea what you want your logo to look like, heck you may not even know what colors you want to use on your overall brand. You’re not alone. It may be easy to buy a domain, order business cards and start a blog, but…when it comes to design that’s on a whole different level. Yes, you can hire a graphic designer or even go to a site like Fiverr – both great options but they’re going to take direction from you. If you haven’t a clue as to what you want, why waste the money, especially when you can do it yourself. Want something more professional down the road – great , but for now let’s get your business set-up and open, so you can get on with the important details like getting clients and making sales – you know the money making activities! This tutorial walks you through the set up of social media headers, business cards, letterhead and even logos, yep everything you need to help grow your business! Let me know in the comments section if this video was helpful, thanks! Want more tips to building your business online? Join our free FB group: theHUBlineCommunity, where you’ll get support, strategies and resources to help you grow a thriving business online.